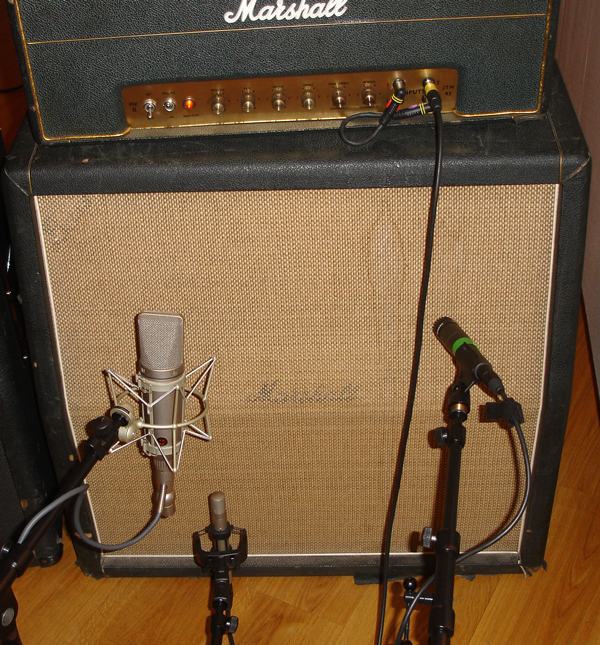 In Guy Fletcher’s last recording diary he had a photo of Mark Knopfler’s old Marshall amp with the matching cabinet. This seems to be the same amp that was used on the original recording of both Money for Nothing and Brothers in Arms. Marshall’s first amps were basically copies of the tweed Fender Bassman. They had the same circuit and consequently the same controls, although they looked completely different. The Fender Bassman was a combo amp with four 10″ speakers, while the Marshall was just a head that was set on a cabinet with four 12″ speakers which Marshall originall intended to be used for bass. This first model was the JTM 45. JTM is said to stand for Jim + Terry Marshall (I have sources that say Terry was Jim’s wife and another that says it was his son), while 45 stands for 45 watts. This power came from two 5881 tubes (a military version of the 6L6 used in most Fender amps) , which was later replaced with the KT66, and again with the EL34. Generally these first amps went through many minor changes, it seems Marshall bought parts in small supplies, and when the next time a component was not available at the same value, they simply took a similar one. The first amps had a rectangle metall or plastic plate with the Marshall logo, as Knopfler’s amp has the later white plastic Marshall script, it seems to be from not before 1965. The controls were (from left to right): presence, bass middle, treble, volume bright channel, volume normal channel. The cabinet might be from the same period. On stage Knopfler often used Electro Voice 12L speakers in his 4×12″ cabinets, and Guy Fletcher added in his forum that he believes that there are also EVs in this cabinet (he seems not to be 100% sure). On the other hand, it might be possible that Knopfler left the original Celestion 20w speakers in this vintage cabinet, at least this is what I would have done. The EV12L has more treble than the Celestions, however, the Celestion are softer but have a distinctive presence peak. And the EVs weigh a lot more, a roady’s nightmare. The combination of Marshall amps and 4×12″ cabinets with Celestions is what made the British rock sound famous, a warm and soft distortion with natural compression from the amp. Note the little patch cable that connects the second input of the right channel with the input of the left channel. 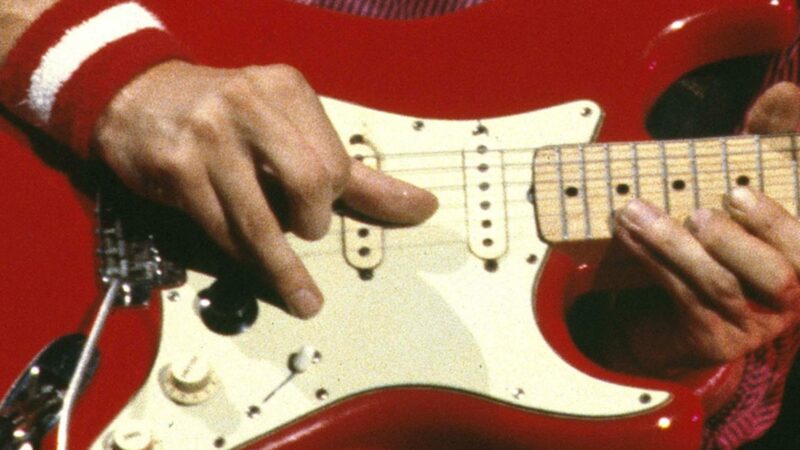 This trick allows you to use both channels at the same time which results in a fatter sound. Yes, this article is very intresting, and I’d say Neil Dorffsman knows what he is talking about. However, never heard about the Laney somewhere else, Guy Fletcher confirmed in his forum that it was a Marshall with a Les Paul, I think John Suhr also said Les Paul. AGain one of the things noone knows for sure it seems. in a german guitar magazine (I think it was Gitarre & Bass) there was an article about Golden Heart and It was said Mark also used the JTM 45 on GH. Of course I don’t know if it’s true. Possible, I think at least I remember a picture from the GH time, showing Mark in some studio with the Marshal cabinet in the background, possibly the head was not far.